"Scary Stories from the Attic, by Ron Hungarter - NW Builder, 9/00 ... northwest builder, northwest, roofing, new roofing tools, do-it-yourself, tools, help, roofers, shingling, roofing tapes, diy, reroofing, layout tape, hand tools, shingled, manufactured housing, modular construction, modular, fiberglass, asphalt, contractors, help habitat, homeowner, DIY, chalk, chalk powder, construction, chalker, magichalk, permachalk, blt, shingles, tape, roofers, roofs, manufacturer, chalkers, shingled, help, equipment, log homes, THOR, free, measurements, builder, builders, chalking, contractor, contractors, lines, reveal, reveals, courses, tip, tips, tool, dormer, dormers, easiest, exposes, exposure, fastest, gable, gables, helpful, hints, hip, homeowner, installer, installing, Kingston, marks, marking, measuring, measurement, newest, safest, striking, string, save, shingling, diy's, new"
In homes that have a steeply pitched roof and are over 20 years old, a 98% probability exists that the attic has excessive heat-and even newly constructed homes often have serious attic heat problems. 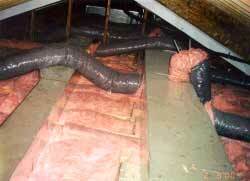 In snow climates, excess attic heat will lead to ice-damming and subsequent water damage. Most people attribute the problem of ice damming to the roofer. However in most cases ice damming and water leakage are not a result of unsatisfactory roofer workmanship, but rather are caused by one or more subtle sources of heat created by the electrician, insulation contractor, HVAC contractor, GC or architect. Your response may be, "I do not live in a snow climate, so I do not have to be concerned about the heat that causes ice dams, right?" Wrong! High attic temperatures increase stress on the roof decking material (plywood or OSB) and will short-en the life of asphalt shingles, as heat is the primary aging mechanism of asphalt. Poor attic ventilation can lead to moisture condensation causing wood rot, attic insulation failure, and the growth of mold and mildews that can lead to health problems for the resident. 1. How does heat enter the attic, and how can those heat sources be reduced? 2. How does heat exit the attic? 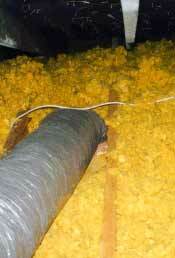 The rule of thumb is that properly vented attic air should never be more than 15 degrees hotter than the outside air. A temperature difference of greater than 15 degrees is an indication of additional heat sources that should be eliminated and/or an indication of poor attic ventilation. Proper attic ventilation is calculated by comparing the ratio of attic floor space to the total amount of "net free air ventilation area." The most beneficial ratio is 1/150; that is 1 SF of net free air ventilation for every 150 SF of attic floor space. All ventilation sold for this purpose has an assigned "net free air" square footage rating that is roughly the total opening size of the vent, minus the various areas of block-age from louvers and screens. Ideally, the total of inlet air at the soffit will equal the outlet air at the ridge for a balanced and efficient airflow. The following are pictorial examples of some ways unwanted heat enters the attic space and some reasons why heat cannot exit the attic space. The silver image at the top center of this photograph is a full-sized, natural gas fired, forced air furnace. In this new addition, only limited space was deemed available to install the HVAC system, so it was installed in the attic space. Aside from the very difficult access for monthly maintenance, the low-slope roof eliminated air spaces above the furnace, further enhancing heat build-up in the attic, leading to snow melt and ice damming. The electrician installed a "standard" recessed lighting fixture in the master bed-room ceiling for use as a reading light over the bed. However, when the light fixture was used with snow cover on the roof, heat generated in close proximity to the roof caused snow to melt and ultimately caused an ice dam. Note that the fixture that is installed is also a fire hazard. Insulation is packed against the fixture, ignoring the required 3" clearance. The electrician should have used a double-walled, insulated lighting fixture that could be safely insulated over. Two additional problems can be identified in this photograph: the insulation is out of position, allowing heat to enter the attic; and the insulation is blocking the soffit inlet vents, eliminating critical airflow into the attic. 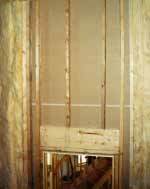 All walls adjoining the unheated attic space must be insulated. Shown in this photograph is an attic stairwell, with a large, un-insulated wall above the entry door. This newly constructed home had excessive ice dam leakage and water damage. Doors leading to unheated spaces should be trimmed as if they were outside doors, complete with saddles and weather-stripping. Another common, but unsatisfactory practice is the installation of bathroom exhaust vent ducts into the soffit vents. Soffit vents are inlet vents, not outlet vents. Everything that exits the house at a soffit vent immediately re-enters the attic space. Not only will this add heat, but it will also add humidity and moisture. 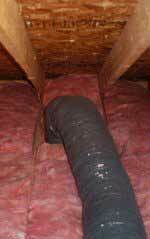 Even a home with functional attic ventilation can develop molds on the inside of the roof sheathing above these unsatisfactory ducts. Visit Ron at Ron Hungarter Associates, Inc.
or, at VIP Certifications .